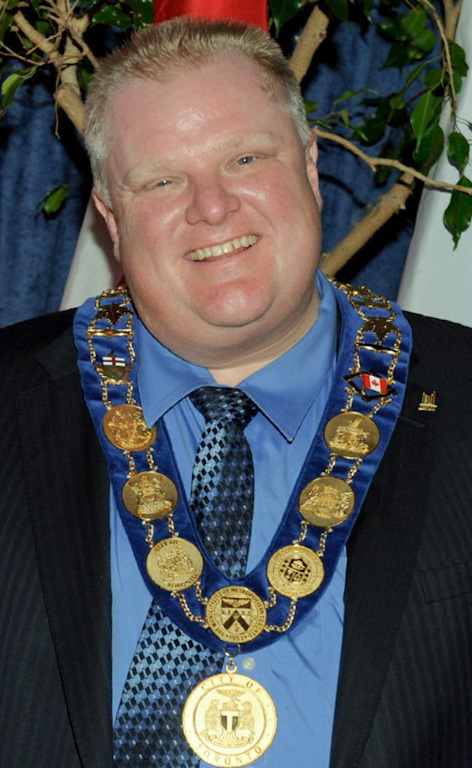 Rob Ford, you will be missed. The former Mayor of Toronto passed away March 22, 2016. Rob Ford was truly the “people’s mayor”. He made it clear in practice that he worked for the public. He was an opponent of excessive red tape and of poor customer service. Mayor Ford responded quickly to an email from Northland Paving. We were outlining a number of frustrations and issues of concern regarding inequalities in by-law enforcement within the paving industry of Toronto. Depending upon where you lived in the City dictated the size of the asphalt driveway you were allowed to have. By-laws were not being equally enforced and Toronto east taxpayers were being targeted. The same email had been sent to his predecessor Mayor Miller. Mayor Miller never had the courtesy of issuing a response. Mayor Ford not only responded but he actually picked up the phone and called. He then set up a meeting with himself, Northland Paving and the various department heads who would have insight to the many concerns being voiced within the paving industry. Rob Ford made it perfectly clear that good customer service within the City should be made a priority and said there was no excuse for it not to be. He expressed his frustration that the “wheels at City Hall turn slowly” as he put it. He then walked us to other offices within Toronto City Hall and introduced us personally to the staff that we needed to arrange further meetings with. We left the meeting feeling that Rob Ford had logic and common sense. He was truly representing both his constituents as well as small business. Yes, he was a colourful character but I believe he truly felt a responsibility to represent the electorate. I hope other civil servants look at the qualities that made Rob Ford so popular and learn from it. HL3 or HL3A Hot Mix Asphalt. Exactly what does that mean and which one should you use on your driveway? HL stands for Hot Load and 3 represents the size of the aggregate used. Generally speaking the majority of the aggregate and stone used in this mix would be 13.2 mm mixed with sand and other fines. The aggregate mix of up to 13.2 mm stones and sand make up approximately 95% of the asphalt mix used to pave a driveway. The other 5% is the asphalt cement otherwise known as bitumen or liquid asphalt. Bitumen is the heavy oil or sludge leftover in the bottom of the barrel during the oil refinery process. The bitumen component (oil basically) is to blame for the softening of our asphalt surfaces during heat waves. It is necessary to use as a binding agent for the aggregates but it will remind us that it is an oil product during a heat wave! So, Hot Load 13.2 mm aggregate Hot Mix Asphalt or simply HL3 Hot Mix Asphalt is the most commonly used asphalt mix. The difference between HL3 and HL3A is simply the amount of sand in the mix. The more sand in the mix, the softer and smoother the driveway will be. The more 13.2 mm aggregate used in the mix, the stronger and more durable the driveway will be. This means that HL3 is a stronger asphalt mix than HL3A. Since more gravel is added to the mix it will be observed on the completed asphalt surface. It will also react a little less during a heatwave. HL3A will be softer and smoother and may still hold up well under light use conditions. Northland Paving recommends the use of HL3 Hot Mix Asphalt because we prefer to build a stronger driveway. The Planning and Growth Committee in the City of Toronto met January 8, 2015. On the agenda was the Driveway Widening Policies for large lots in Scarborough. Toronto Ward 43 Councillor Paul Ainslie brought the matter forward after hearing complaints from the constituents in his ward. Northland Paving clients Wayne and Danielle Earle had reached out to him out of frustration when the city would not allow them to repair their existing driveway to its’ former glory. We find it very frustrating at Northland Paving to try to explain to the residents of the eastern section of Toronto (Scarborough) why their properties cannot enjoy the same rights in terms of driveway size as other parts of the City. Or why a new subdivision can build double width driveways on a 30 foot lot when they are not legally able to keep a double width driveway on their 60 foot lot if they have a single car garage. In Scarborough the driveway must be the same size as the garage door. The Planning and Growth Committee was unable to reach a decision with regards to the fate of the Earles’ driveway and that of the rest of the City east of Victoria Park. They have referred the matter on to the Chief Planner and Executive Director of City Planning for a report on how the driveway widening policies differ throughout the City. The Planning and Growth Committee will revisit the item on April 13, 2015. Let’s hope the City will do right by its residents and allow homeowners who have had an existing driveway for 10, 20 or 30 years the right to repair the surface to its original state. Let’s hope Scarborough will be afforded the same rights and benefits as the rest of the City. If you read this blog before April 13, 2015 please contact the Planning and Growth Management Committee or your City Councillor and let them know Scarborough residents seek equality. Fair is fair. Toronto Bylaw Battle: Residents forced reduce driveways. Here we go again! The City wages war on Scarborough homeowners. The following news story was on CTV News http://toronto.ctvnews.ca/video?playlistId=1.1926795#1.815892. It seems the City is redoing the curbs on Marta Avenue and has decided to not allow a ramp on the portion of the driveway that has been deemed “illegal” or “not to code” regardless of how long the driveway has been that size. Several home owners now have spray paint on their driveway where the City wants them remove that portion of asphalt and replace it with sod. The result is frankly an eyesore, an added expense and a huge inconvenience for Scarborough homeowners. The homeowners are justifiably upset by the fact that a neighbouring street had the same curb restoration done last year and none of the homeowners lost the use of the driveway portion deemed illegal. There are so many reasons that this is just plain wrong! We at Northland Paving have been told by the Zoning Dept. at City Hall that these driveways would be “grand-fathered” and allowed to remain. Of course the Right-of-way-Management Dept. (who controls the City owned portion of the bottom of your driveway on your side of the sidewalk) will not allow it, no matter what. We are unsure why they are so bothered with this part of the driveway in Scarborough. We have yet to receive any pushback elsewhere in the City of Toronto for this. The reasoning given by the City is flawed. They will say it has to do with water drainage yet the homes in Scarborough that are targeted have more than enough green space for this to matter. In fact, if permeable pavers are allowed to be used in this illegal area the water absorption would be greater than the replacement sod. They say a walkway would be acceptable in this space but it is not the case, our clients have been forced to raise existing adjacent walkways or install curbs alongside of the walkway (but everything must remain flush with the sidewalk on the city owned portion of your walkway so as not to be a trip hazard or interfere with the snow plows) . This is to insure you don’t park on this area and without regard to those in wheelchairs or walkers. Most of the houses in central Scarborough were built in 1950’s – 1960’s on large 50 – 60 foot lots. Our automotive needs were different back then as the City was smaller and most families only required one car therefore houses were built with one garage. This is really where the issue lies. The rules in Scarborough will not permit your driveway to be larger than your garage door. As the City has grown based on highway development and not subway development and times have sure changed, most households need to rely on more than one car per family. The only way to get around this legally would be to reconstruct the house and build a 2 car garage. As drastic as this seems, you would legally be allowed to have a wider driveway. If you knocked down the entire street and replaced those 50 – 60 foot lots with smaller semi’s or townhouses you would be hard pressed to find much green space at all for the water run-off. It seems that water run off can’t really be an issue after all. At the end of the day, why should the City really care about the size of your driveway? As long as it is well maintained, sized tastefully leaving adequate green space and servicing the needs of the tax paying homeowner the City should get off your driveway and move on and find something of real importance to focus on. Driveway permits in Toronto, what is the purpose? The reason for the $139.20 permit changes depending upon who you talk to within the City. Northland Paving is an established reputable paving contractor doing business in City of Toronto since 1985 and we still can’t figure out the true benefit. One may call it a tax grab but the reality is that it is probably costing the City more to administrate than it collects in revenue. It has a hugely negative impact on paving companies in Toronto, their employees and most homeowners alike. The paving season in Toronto is short to begin with, approximately 7-8 months. Any good contractor is extremely busy during that time and most employed in the industry are seasonal workers. So what does driveway permits have to do with seasonal workers? There are many negative layers to the driveway permit dilemma. 1- The driveway contractor works on volume to complete 12 months of work in 7-8 months. The permit officers claim a 1-2 day turn around period to receive the permit but the reality is 2-3 to weeks to receive a permit. No work may commence before the permit has been received. Scheduling has become a logistical nightmare as the contractor can no longer work in an efficient manner and will need to increase pricing in order to compensate. The backlog at the City means there is no steady flow of work to the contractor. This bureaucratic red tape causes lay-offs as paving crews cannot report to work. This issue falls on deaf ears at City Hall as City staff see no problem with these employees not reporting to work and not getting paid. Paving is a tough industry to begin with as employees already lose income to rain days but to lose income to inefficiencies at City Hall seems highly unfair and disrespectful. How fast would policy change if a paving contractor had the ability to cause a City worker to lose pay? 2- Homeowners have the extra burden of paying a $139.20 driveway permit fee. In some cases this will be the only inconvenience for them in addition to a delay in the project start. In other cases (and there are many examples) the City will place the driveway project on hold citing minor curb or sidewalk work do be done. They cannot give a definitive date for these works to be done other than to say some time “this season”. Homeowners are also inconvenienced and understandably upset if the permit dictates a reduction in the size of a driveway they may have had in place for over 20 years but this will be discussed on a subsequent blog. 3- What are the steps involved in obtaining a driveway permit? Although the City is considered to be one, the rules differ on how you obtain a driveway permit and what is deemed legal depending upon what part of the City you reside. In Scarborough and North York an application must be made at City Hall, once received the City will dispatch a Permit Officer to go inspect the driveway. In downtown Toronto and East York and appointment must be made to meet on-site with a Permit Officer who will then issue a directive, with the directive you may then apply for a driveway permit. The Officer will fill out a report with their recommendations and submit it to the City who will then make the permit available for either the homeowner or contractor to sign. Many cases minor issues are found with City curbs or sidewalks and the City will call for their replacement. Sometimes the repairs are necessary often times it is not and it seems the City is willing to spend money unnecessarily. The Permit Officer will again return after the work has been completed to insure compliance. Northland Paving has been fighting for change with the City of Toronto as it pertains to driveway permits since they were introduced. The reasons cited for permits differ depending on who you talk to and we will discuss this on a subsequent blog. Northland Paving met with the Mayor and the head of the Department of Transportation Services (this is the department responsible for driveway permits) in 2012 in an effort to create efficiencies within the permit process. The Mayor agreed with the downside of permits and the process to obtain them and cited that the wheels at City Hall turn very slowly. The head of the Transportation Services vowed that processes would be made quicker and more efficient and that the customer service would be improved. The wheels turn very slowly at City Hall indeed as it still takes up to 3 weeks to receive a permit. It is noteworthy that none of our neighbouring Cities in the 905 area are require driveway permits and homeowners are free to upgrade and beautify their properties! Driveway Permits in Toronto were not a requirement before the City of Toronto amalgamated with North York, East York, Scarborough and Etobicoke. In 1998 there was peace in world of driveway contractors in Toronto. Homeowners were able to maintain their asphalt driveways with ease, so to speak. The enforcement of driveway permits in Toronto although a by-law in the books was virtually unenforced anywhere other than North York. The only reason North York sought to enforce them was in response to the frustrations of homeowners who had their driveways replaced only to have the City come along and tear up the City owned portion for public works. The motion was passed by North York’s Council as a means to do a check and provide a clearance that no conflicting or planned work was scheduled for a given property. Post amalgamation, the City began redistributing staff across the new Toronto. In 2008 the dust was blown off the old Scarborough By-law Book and it was discovered that Scarborough actually also had a requirement to obtain driveway permits. Northland Paving has been paving driveways in Scarborough and the rest of the GTA since 1985, legally, and driveway permits had never been a requirement until 2008. The City of Toronto then faced the task of merging all of the different zoning by-laws and requirements into one fit for the City. Meanwhile, this left spotty and unequal interpretations of what constitutes a legal driveway. Several attempts had been made trying to consolidate the zoning by-laws before finally being released in 2013. It is still unclear as to the real reason for the requirement of driveway permits in Toronto. Northland Paving will explore this in a future post. The City has stated that if an existing driveway size does not comply with the new zoning by-law but was legal before, it may grand-fathered and allowed to remain the same size. However, it is not the Zoning Dept. but rather Transportation Services, Right-of-Way Management that grants driveway permits and have different thoughts on the issue. Do you need a Driveway Permit in Toronto to re-pave an existing driveway ? The answer is yes. The Toronto By-law states that you must obtain a Driveway Permit and you must only hire a paving contractor licensed to work in the City of Toronto. The process for obtaining a permit varies depending upon which part of the City you reside. What dictates an acceptable driveway also varies depending upon where you live. Toronto is one of the only Cities who require a Paving Permit to replace an existing driveway. Cities usually only require a permit if a brand new driveway is being installed to service a new dwelling or if an existing driveway is being widened. Toronto requires a permit for any works done by a paving contractor. This By-law has been challenged several times by Northland Paving at City Council meetings, with the Mayor, City Council Members and City staff alike. The enforcement of and the reasoning behind this By-law has been evolving over the years and has not been evenly enforced across the City. The great ice storm of 2013, frost quakes, polar vortex, wind chill factor and frost heaving all are terms we have heard far too long as Toronto strives to recover from the coldest winter on record for the past 20 years. What is frost heaving and why is it effecting your driveway, patio, sidewalk and steps or retaining wall? Moisture present in the soil will freeze and swell up. The deeper the frost goes the further up these surfaces will raise. Compounding the issue this spring is that the Toronto area experienced an unusually large amount of snow this past winter. We had a few mild days absorbing the moisture from our melting snow and then got hit again with more cold weather freezing and swelling up the soil below our paved surfaces. 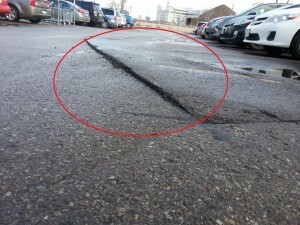 This winter has seen Toronto and its neighbouring Cities increase budgets for road repairs. Many driveways have cracked due the heaving cycle and others have been damaged as snow ploughs have grabbed and peeled the edge of a swollen driveway. The worst casualties will come from driveways and parking lots that were teetering on the edge of disrepair. Northland Paving expects to see many road repairs in the summer of 2014 in the Toronto area. From an industry perspective, it will be a late start to what will be a very busy 2014 paving season as frost is still present in the ground at this late date. In an industry riddled with fly-by-night operators and a new crop of paving scams surfacing every year, it is little wonder that consumers are often perplexed on how to find a reputable paving contractor in Toronto. There are of course some online searches a consumer can perform to pre-screen the contractors they wish to obtain quotes from. A few choices like HomeStars and the Better Business Bureau while being wonderful resources are not the only options. Sometimes a disreputable contractor can have a wonderful website and a good honest contractor may not. There are paving contractors in the GTA who operate under several different names or change names and phone numbers frequently once bad ratings are presented online, unhappy clients are calling or creditors are closing in on them. How is a consumer to choose the right contractor? Northland Paving advises you to be diligent and do your homework. With the right paving contractor your project should last for many years after your warranty expires. Make sure everyone is quoting on the same specifications, if not why not? Is someone selling you more than you need or less then you should have? If a price seems too low or too good to be true, the contractor may be planning to take short cuts or skimp on materials. If an unusually long warranty is offered, be alarmed. The promise of an extended warranty means nothing if a company is unable or unwilling to honour it. There are several sites and online forums that can help provide information about the contractor you are about to hire. HomeStars, BBB and 411.ca are only a few of the options available. If a paving company tells you they have 30 years’ experience but the business is newly registered, perhaps this is a company who needs to change names frequently to avoid creditors, warranty work or bad online reviews. Do they have an established place of business? It’s difficult to track a company who deals only out of the back of a pickup truck with a cell phone number and a PO Box for an address. Check out their place of business to determine if this is really a company you feel comfortable dealing with. If you think it’s too far for you to bother, chances are it will be too far for them to return and service your driveway or patio project should you require any warranty work. Check their phone number on 411.ca. Do a reverse search. This will tell you if the phone number is legitimate or a cell phone that you will never be able to reach if they don’t want you to. Is the paving contractor licensed and insured? The City of Toronto and the City of Markham require paving contractors to be licensed to pave, this is the law. The licensing process requires paving contractors to be insured. Licensed contractors know how to install a legal driveway. The City will ask you to restore an illegal driveway into compliance upon discovery regardless of how much money you spent to have it installed. Ask if the contractor is registered and in good standing with WSIB to stop any liability on your part should a worker become injured while working on your property. Who did your friends use? Word of Mouth is also one of the best methods in the decision making process. If a paving contractor has been referred by someone you trust and they have been happy with the business practices and finished product then perhaps you will too. A good contractor thrives on referral business. A little time spent researching a company you plan to use and a good gut feeling, may help you avoid a nightmare down the road. Last but not least, check out past finished projects in person.